My wife often says that when I go on a vacation that I always try to repeat the same trip in my pursuit of the same experience I originally had, and that more often than not it never ends up being as good as the first time. Thus far, she has been correct. I was returning to Argentina three weeks after our wonderful trip to the same place and there was a part of me thinking “Can this possibly be as good as the trip the last one? This is going to be hard to repeat”. On this trip, I had a father son team from California, David and Braden. They are very good clients and friends. 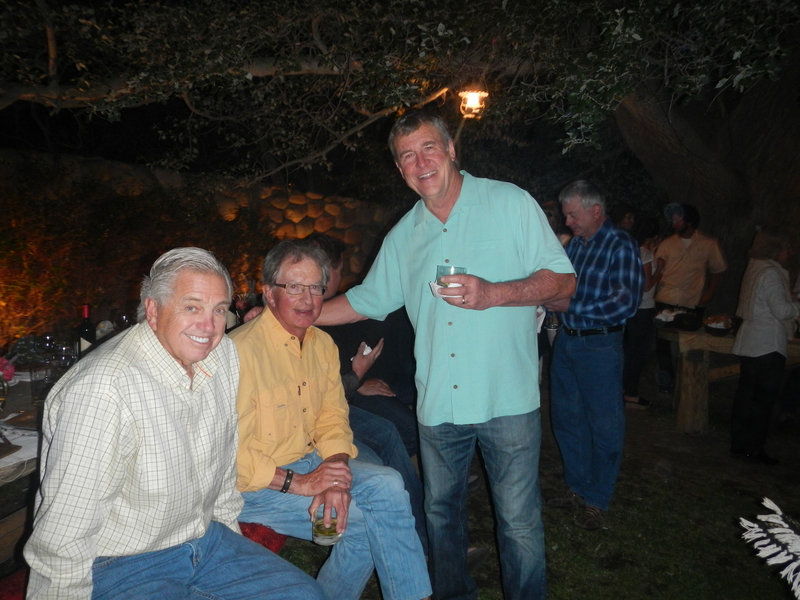 Also joining us was a good friend and also in the business, Reed. The three of them have never been to Argentina so they had no idea of the massive travel adventure that laid in wait before them. 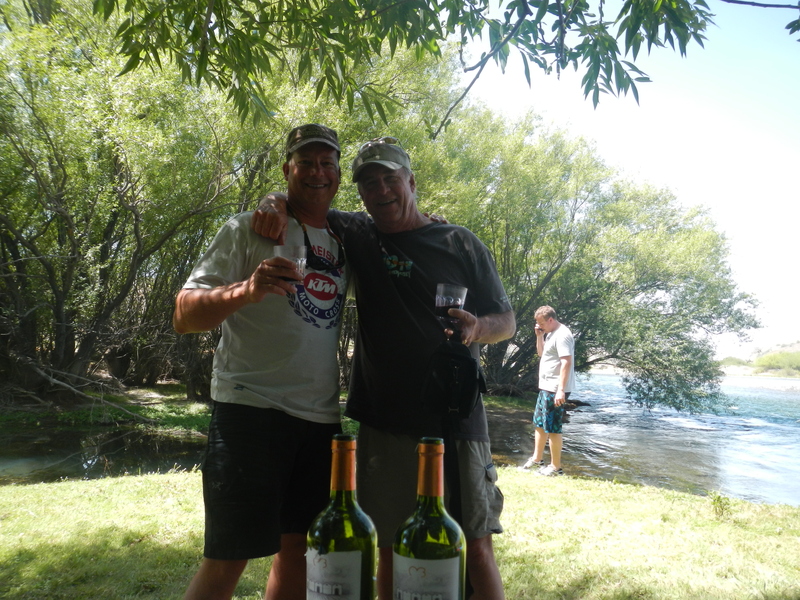 We went to Cordoba to dove hunt for four days then down to San Martin Los Andes. 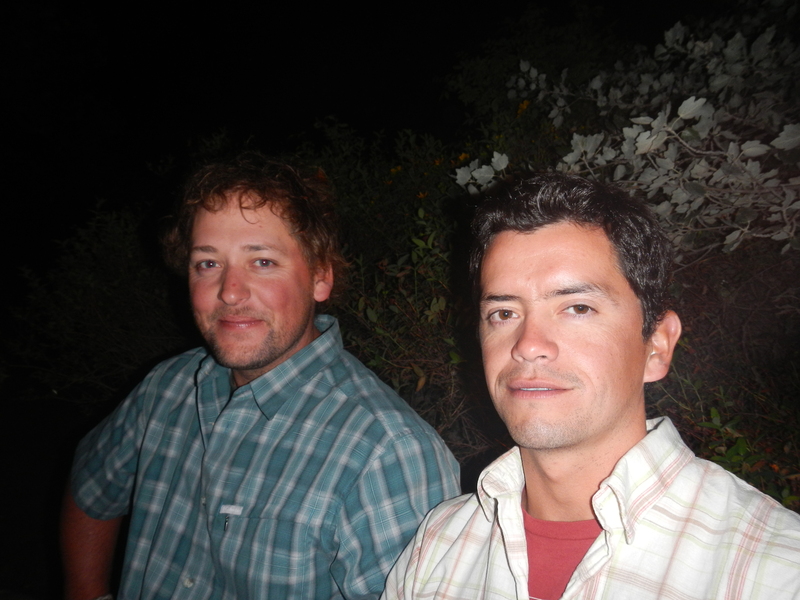 I will blog about the bird hunting later, lets start in the middle when we got off the plane in Neuquen. 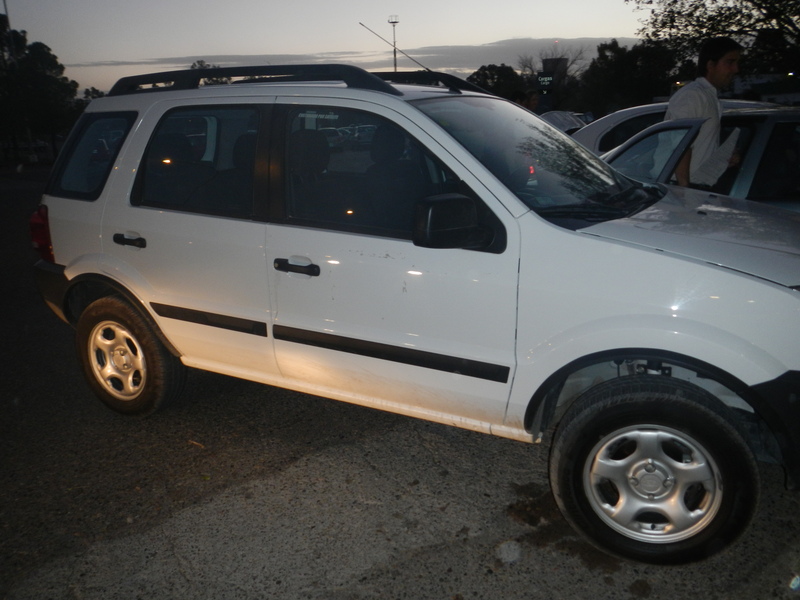 The airport in San Martin was closed due to the ash so we had to rent a suburban to get the four of us and our gear down to Patagonia River Ranch. I was a little skeptical about Hertz having a Suburban rental because I never saw one the entire I time I had been in Argentina. So I relieved myself of my driving duty and they woke me up to ask me where to turn at. Somewhere in between we stopped for fuel and put regular gas in the diesel tank. 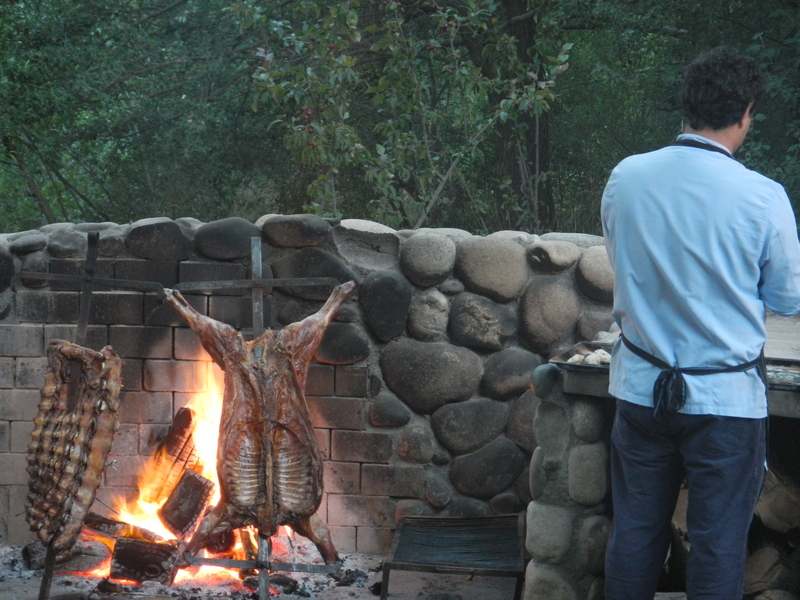 Hours later we arrived at the Patagonia River Ranch and it was like I was a long-lost family member welcomed home. At some point during the welcome party I saw Claudio the chef and ran to him like a fat kid in a candy store. We did not dilly dally around we loaded up and I drank some coffee to offset the ambient in my system and soldiered up for some fishing. 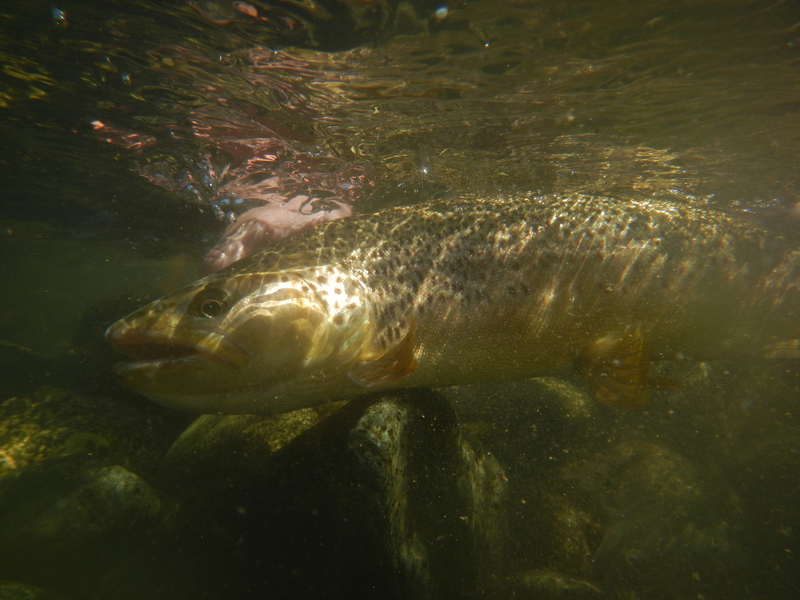 We were ripping out roll cast all with dry flies in shallow water searching for good brown water when I hooked a nice Brownie. The wind picked up and we were ready for some dinner and my main man Claudio did not let me down. 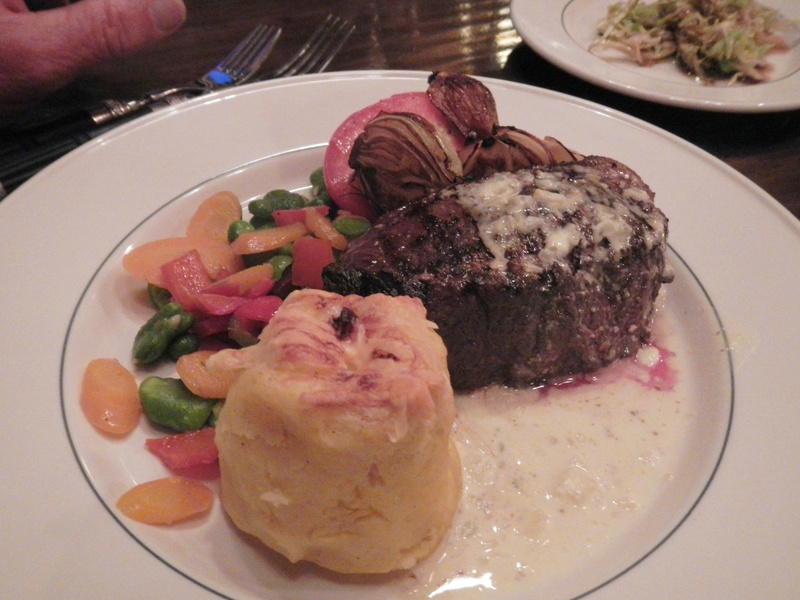 This would be my 43rd steak in Argentina, I did of course reduce my empanadas intake down to just having Claudio’s at the out-door Asadore that was coming later. The next morning after a hearty breakfast we headed out for the Alumine river. 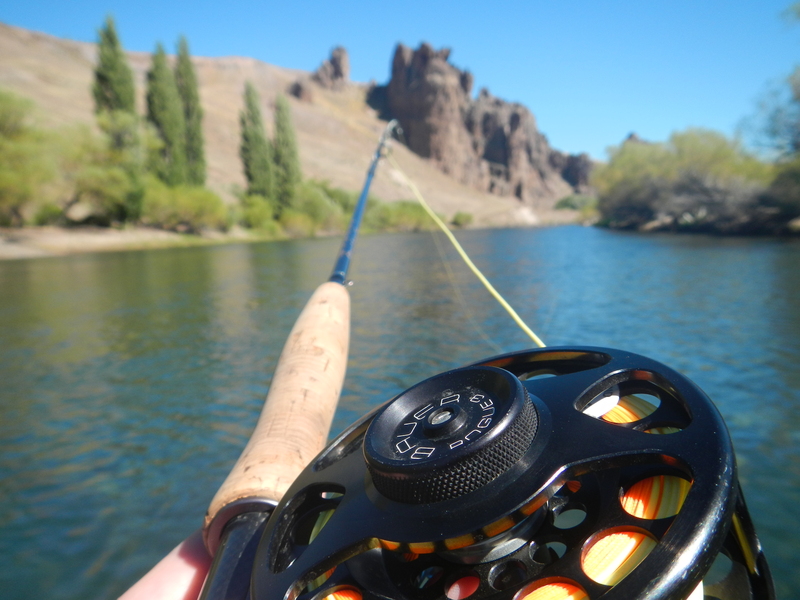 Which I think is one of the prettiest rivers in the world, and some good fishing to boot. Do you want to know what it looks like to be the first boat on the water jumping out in the current to fish fresh water while your buddies wait for their guide to go to the bathroom?  It looks something like this…. 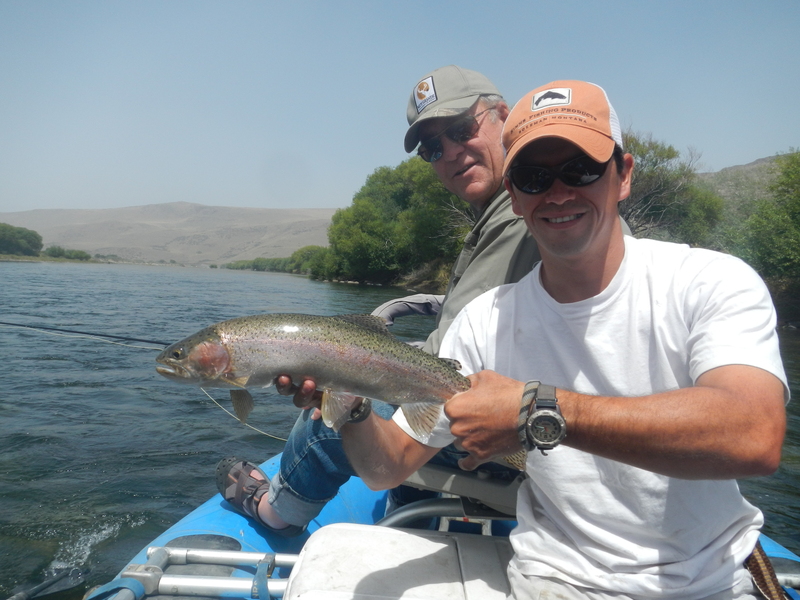 Dave lands his first Rainbow on the Alumine with a nice cast out in some flat water. After catching roughly twenty nice size Rainbows Dave and I built up a little hunger for some lunch. 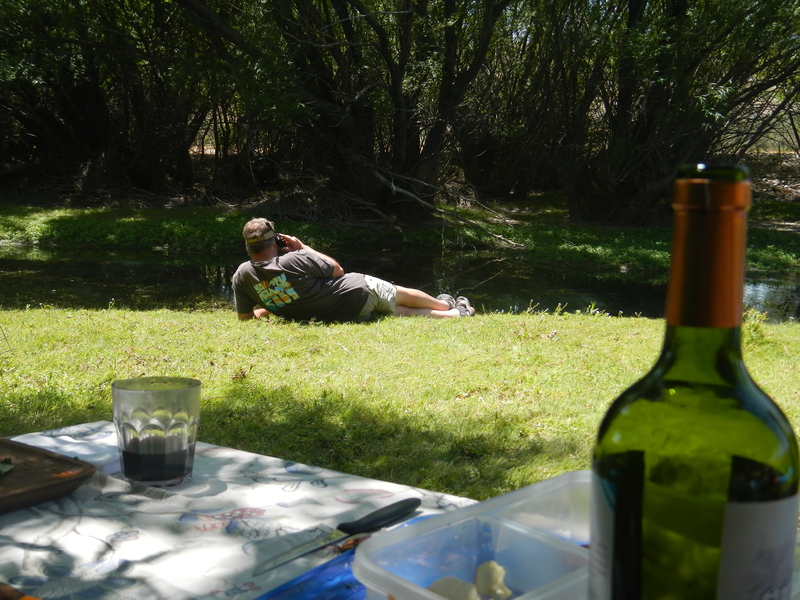 We all met at a beautiful spot on the river to enjoy lunch and a few bottles of wine. The Guide, Santiago made a special lunch for me. 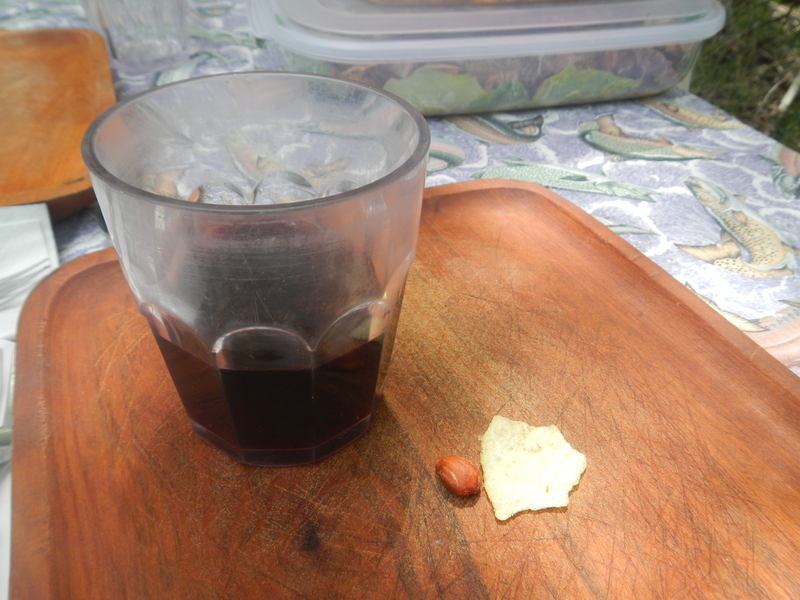 A peanut and piece of chip with a good Malbec. 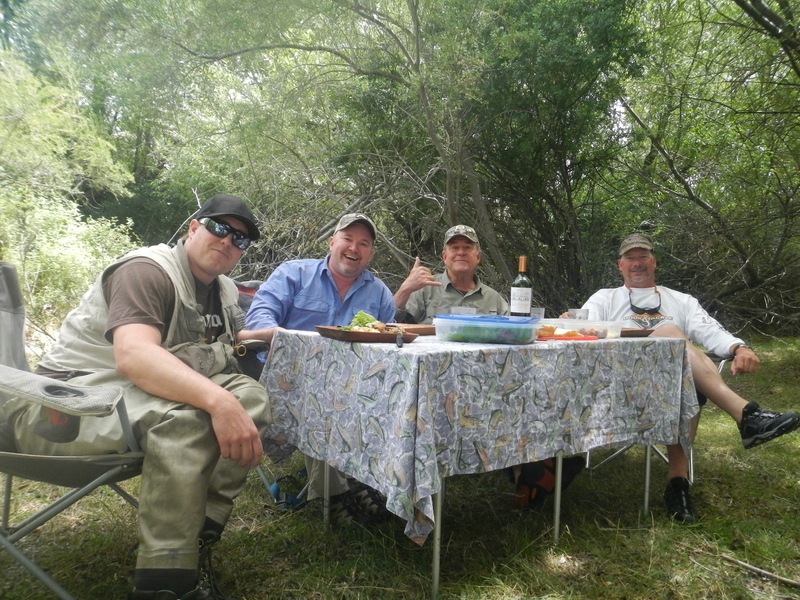 We all enjoyed a nice lunch, at about this time we realize that our guides only put 6 beers in each of our coolers. We are relaxed enough looking in the photo, but in our hearts we were stricken with fear. 20 seconds after this photo was taken there was a mad dash for the coolers for the last beer. 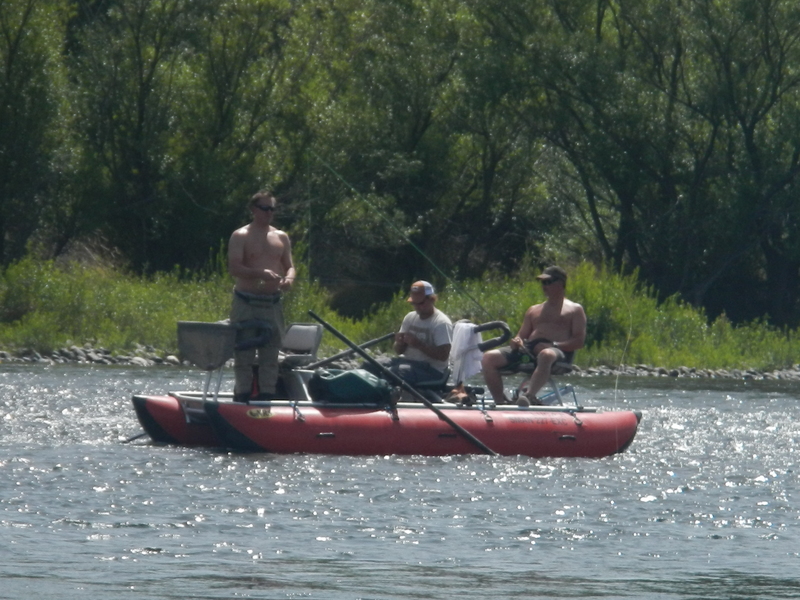 We continued on fishing…with no beer. Dave and I were enjoying the day when out from around the bend a boat was coming out of no where with Maverick and Goose from Top Gun. What are the chances of that? The next day Braden and I joined forces in our search for the illusive Big Brown. Braden jumped off the boat and started on his own down through some shallow water with large river rock in hot pursuit. It did not take him 5 minutes before whooping and hollering. Braden with a nice brown, notice where the boat is? That is how far he walked. Braden’s fish being released back into the wild. Thank you fish. We stopped for lunch and a few bottles of Malbec. What I am going to show you now is the true fundamentals of how to look cool when on a satellite phone….which is later lost after Reed dives into the river with it on his belt. These are not staged photos, and this is the last time the satellite phone is photographed before it gets dunked in the river. Here is Dave talking to his wife. Can you look any more relaxed than that? 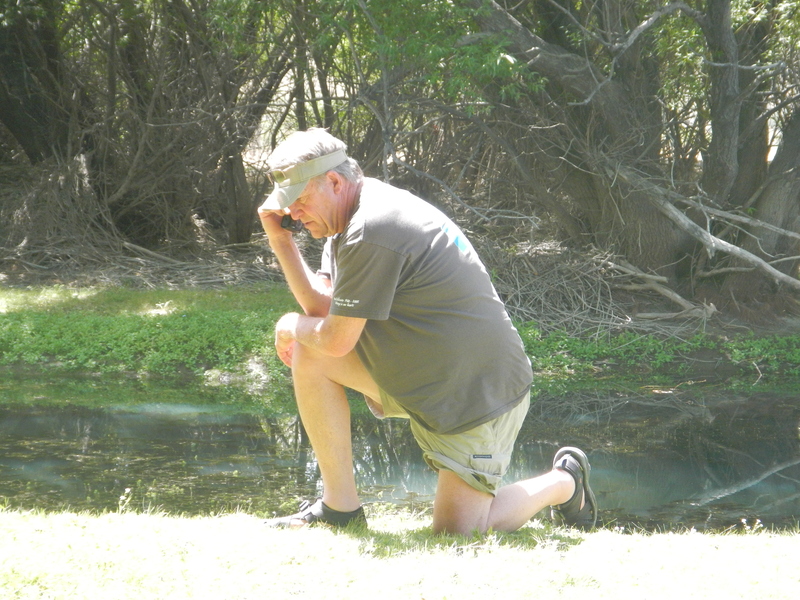 Moments later Dave gets out of his relaxed phase and enters…..
That is correct folks, he is now doing the “Tebow”. Again…this is not staged! Braden then takes the phone but calls to check in with work. 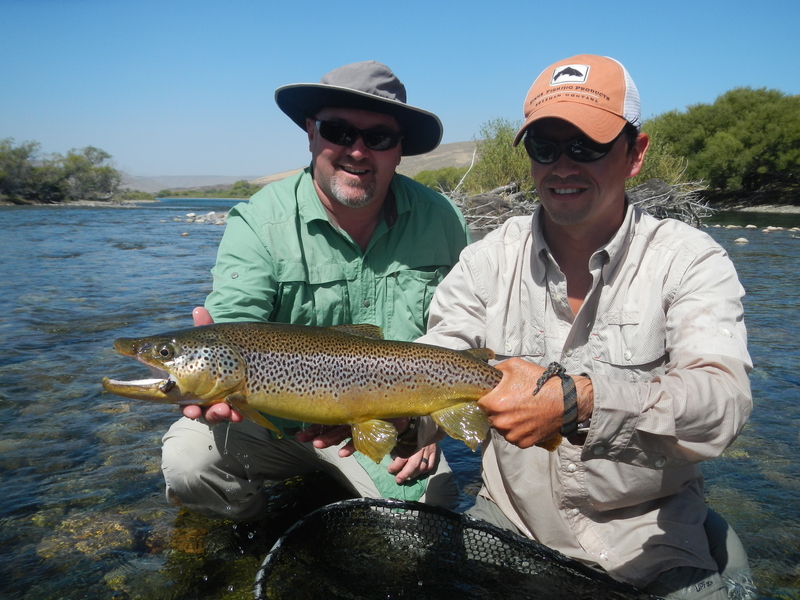 I was pulling large streamers all day, because that is what I heard the owner of Patagonia River Ranch, Ken does. He also happened to be down at the ranch at the same time we were so I was picking his brain about what he does to pursuit the large browns. The evening before I was talking to him and my guide Nicko came up as we were talking about streamers and he looked at me like I was betraying him because Nicko liked me fishing with all surface flies. 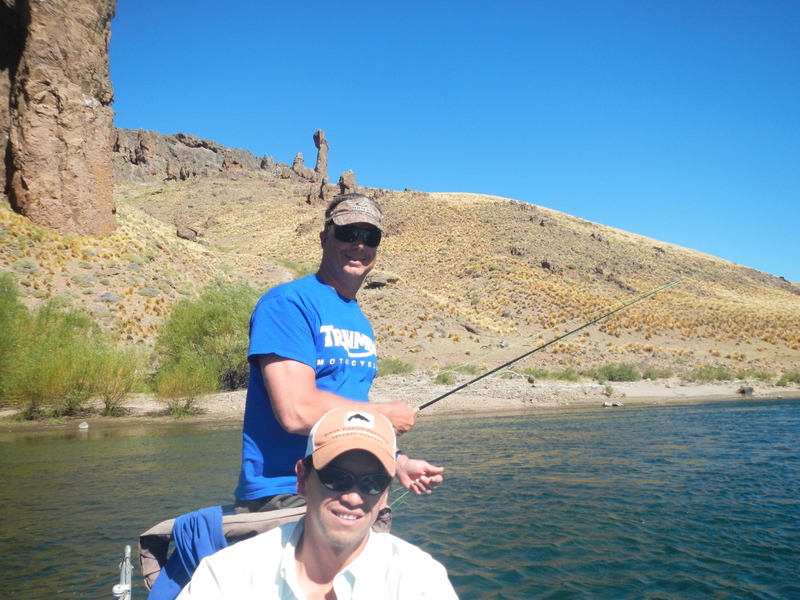 I took Ken’s advice and I went streamers this day, and still had not caught a big fish. This afternoon, I rigged up my 5 weight just for surface action if I needed it. 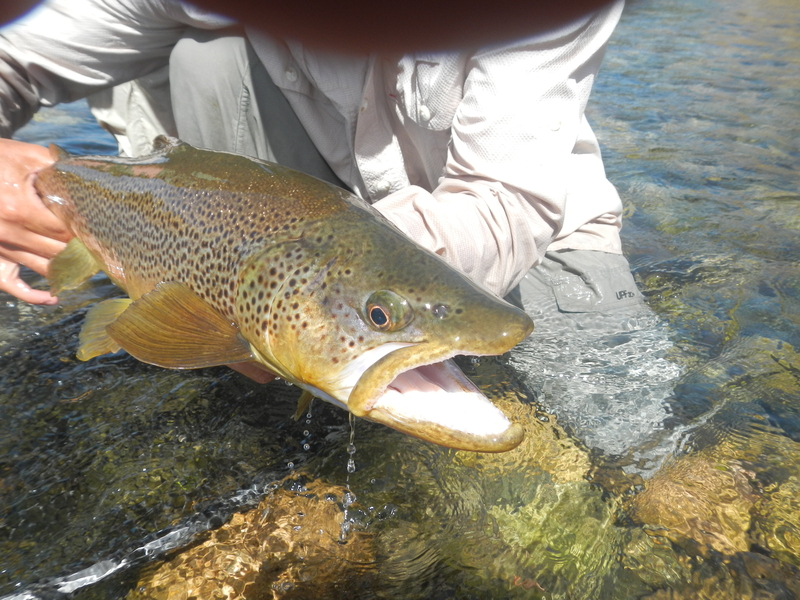 Not an hour after we made the switch back to the surface I hooked into a real dandy….on a surface fly. It was a perfect cast for me with a nice tight roll under a shaded tree and I gave it a small twitch as the beetle hit the water, not a half second later there was a thrashing with a large mouth that came out of the water. Nicko and I saw it and knew it was a large brown. 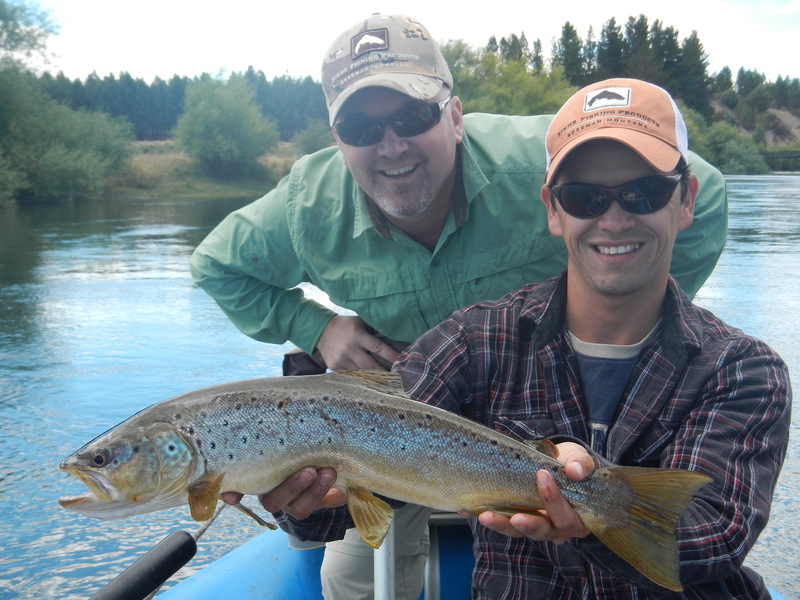 Shay’s large Brown and Nicko my buddy and guide. He is one of the best, I told him at least 100 times that I taught him everything I know. Releasing “Wally” for another day. Be well my friend. I retired my casting hand for the day and watched Braden land a bunch of fish, all the while drinking a beer (the guides brought beer this time) with a smile on my face. 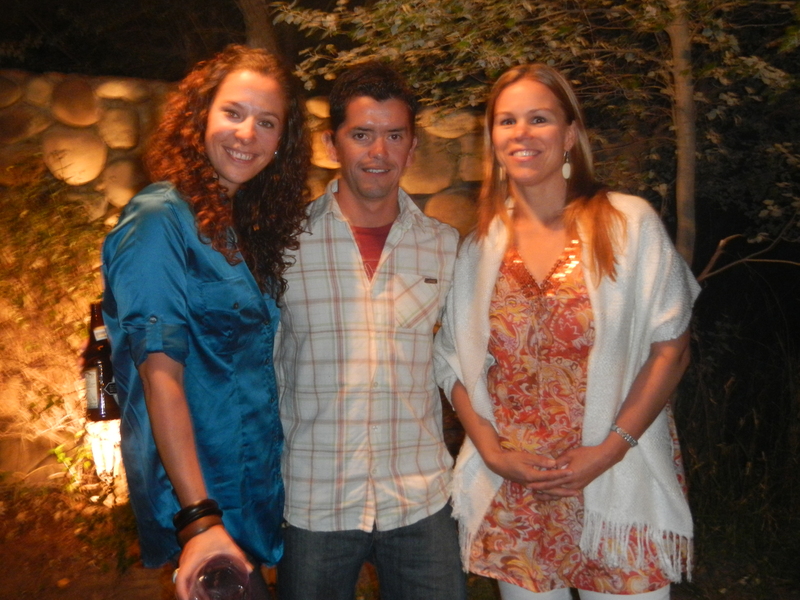 That evening they had the Asadore (outside Argentinian BBQ over a fire). That evening we all shared in a wonderful meal with great wine. That evening after we had our stomachs full of wonderful food and some good belly laughs about what had happened that day on the river. 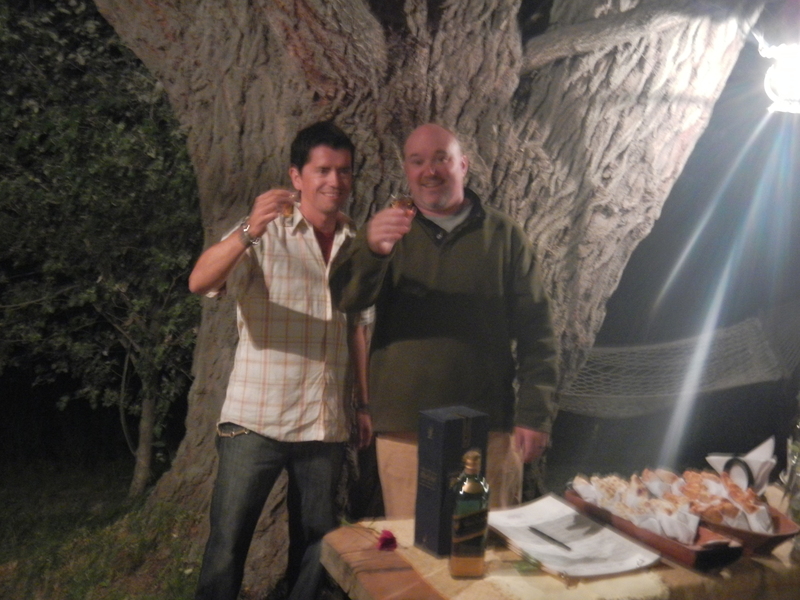 Ken stood up and inducted me into the “Blue Label Club” . 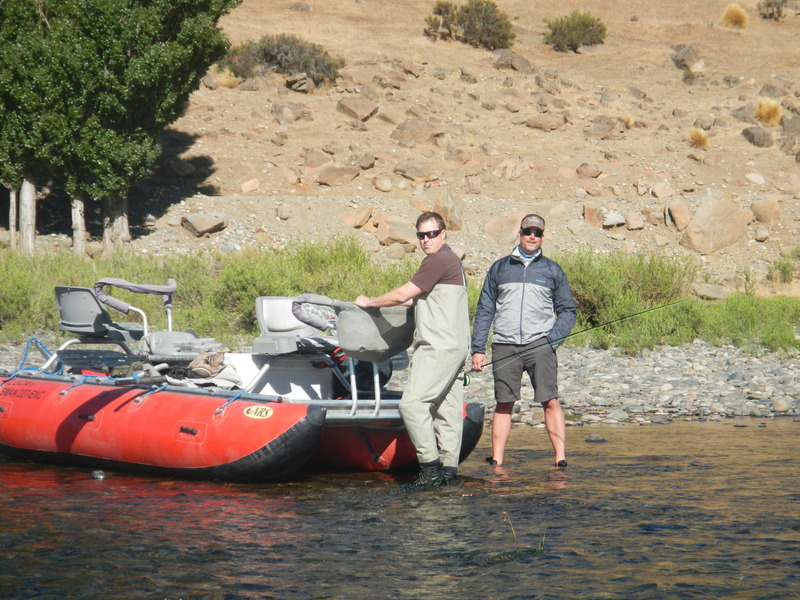 Apparently when you bestow yourself a fish over 25″ inches your inducted into the BLC and written down in the Patagonia River Ranch bible of famous Patagonia fishermen. I actually was sitting next to a very nice lady named Candy who actually was in the book several times with fish larger than mine, not only was she a classy act, she was a “fine fishermen” as the father in the River runs through it described his son. Your guide comes up to the table with you and you tell the story as you recall it and your guide nods his head like he agrees with every thing your saying. I got inducted into the hall of fame, and Nicko got to sign his name into the book next to mine. 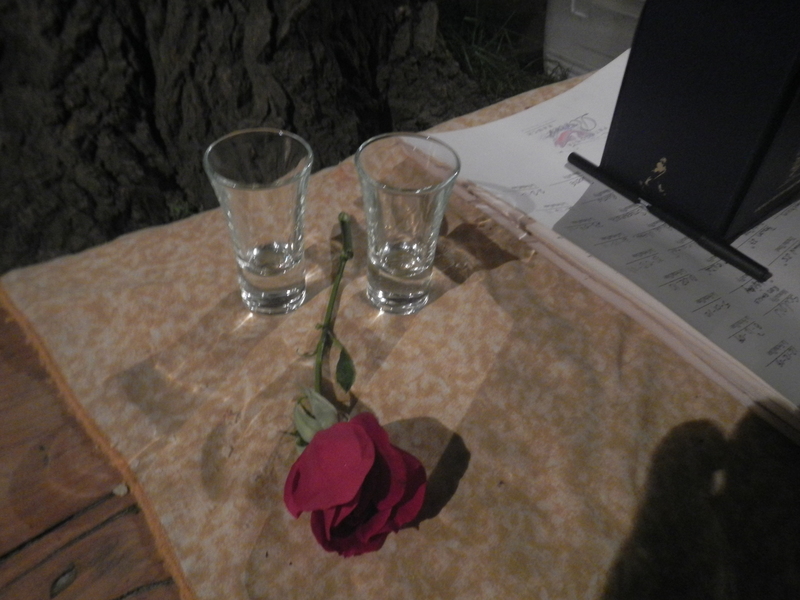 I felt a little awkward when I looked down at the empty shot glasses. I guess there are some benefits to getting your fisherman onto a big fish. 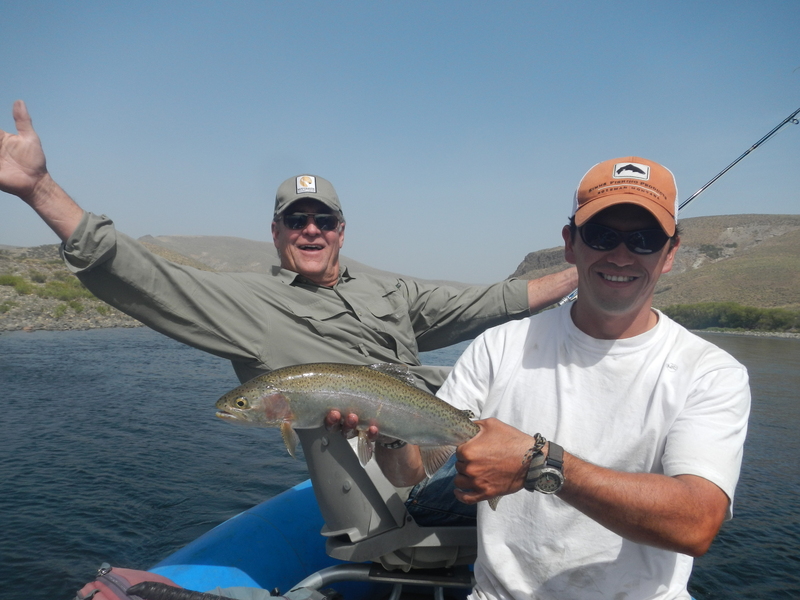 The next morning was our final day fishing and the guides were really excited about taking us to the upper Alumine. 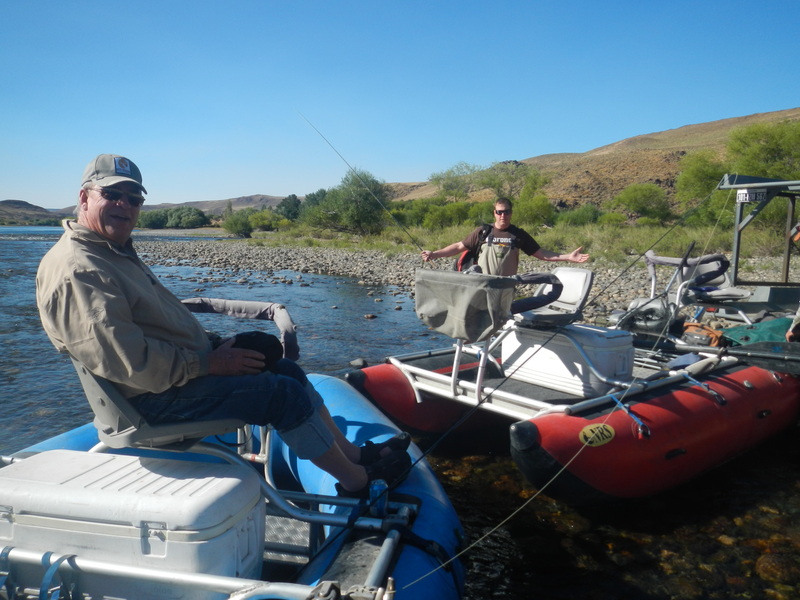 We knew it was a long drive and wanted to fish the Chimehuin but they had some tremendous days up there and really wanted us to fish the waters. Something happened up in the upper Alumine that changed Nicko for life. I cannot really talk about it because Reed, Nicko, and I are sworn to secrecy. However, if I get an email from Nicko telling me that it is okay to discuss my misfortune I shall. Chances our he probably already told everyone at the ranch by now so I am in another Blue Book. 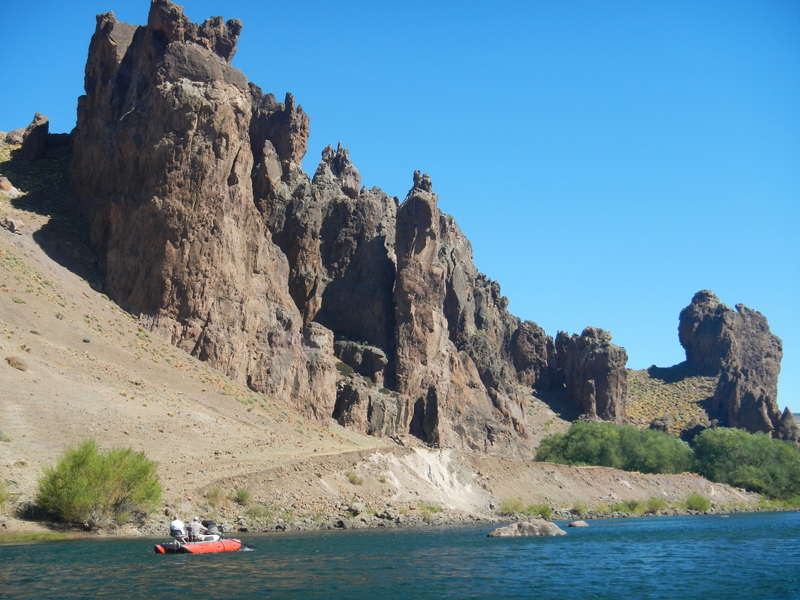 The Alumine is a fantastic river to float, it has majestic rock formations that were the living grounds of the ancient people. This rock formation above had caves in it with drawings on the wall. We did not have time to go up and look but I envisioned the cave man with drawings of stick figures with fishing rods and a fish. 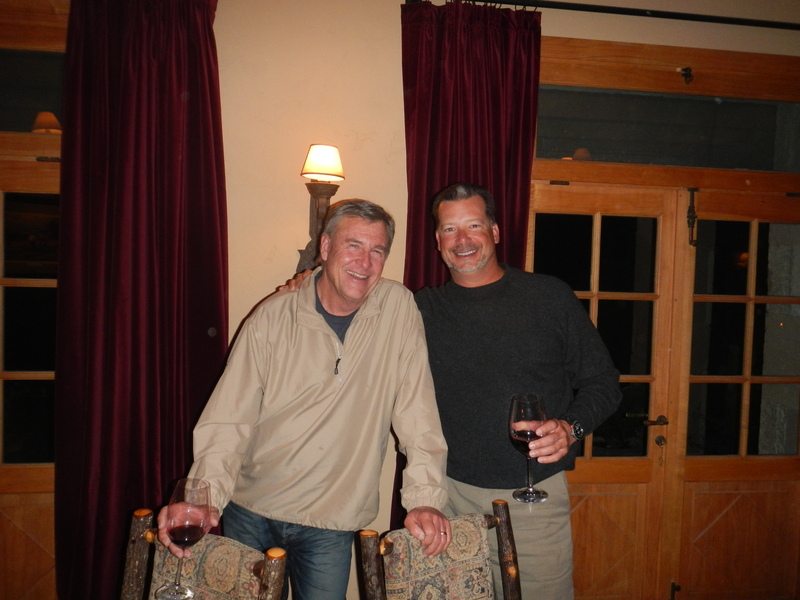 Reed and Nicko look like they survived another great day. 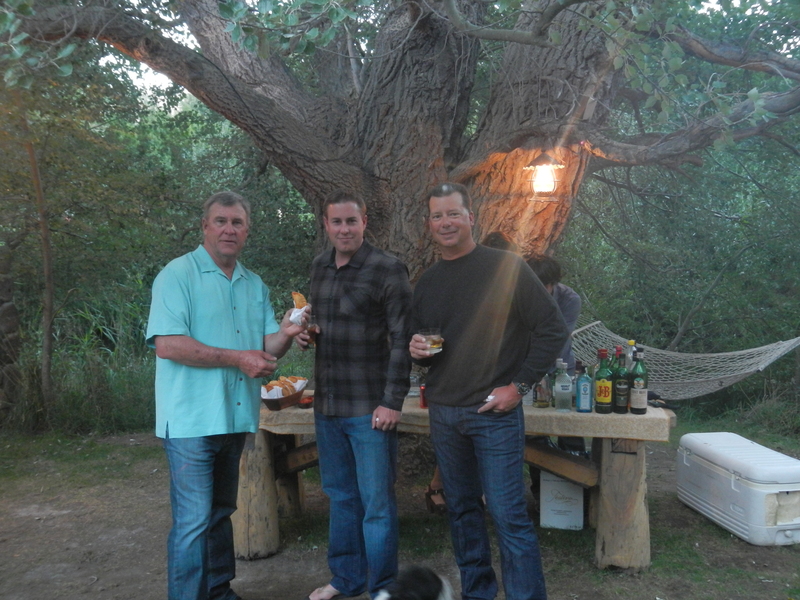 We finished up the day and had another great dinner and the next morning we said good-bye to our friends of Patagonia River Ranch. They set the bar earlier this month and again they met the standards of providing the best service, product, and experience. We all got great sleep on their comfortable beds and gained 20 pounds. If I was to give a recommendation on a fly fishing bucket list this place would top the list. 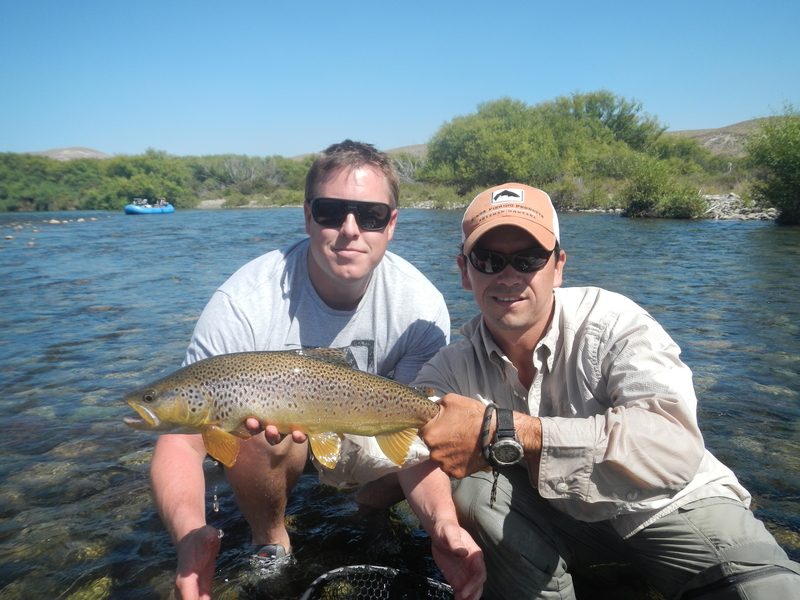 Thank you Ken and Patagonia River Ranch staff for making another unbelievable trip. I would also like to thank Nicko and Santiago for putting up with us on the river. We joke around a lot and that is what makes our fishing together special. 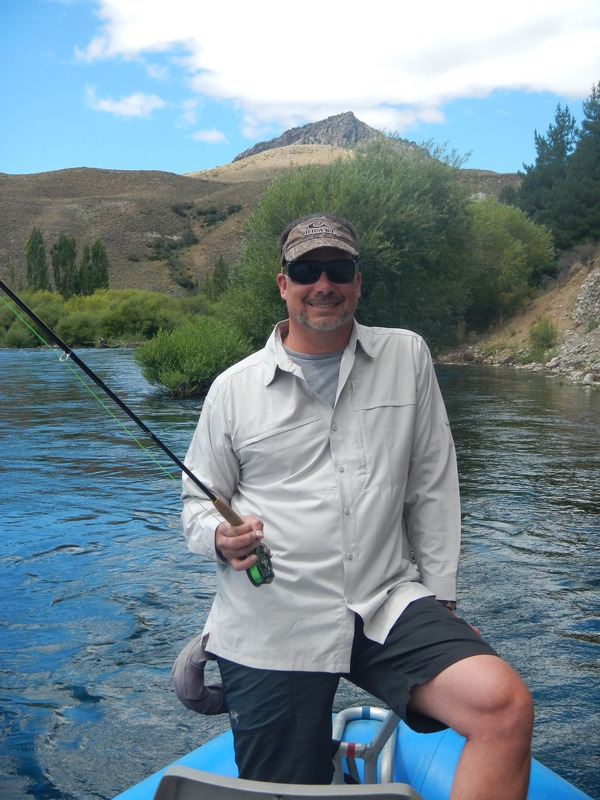 Wanted: American Girl Friend for two Argentina fly fishing guides. Santiago builds guitars it takes him 6 months to build one working at a pace of 20 minutes a day and Nicko is studying to be a dentist, he should finish school in about 23 years.